If only the characters in Mullins’ stories had “measured twice, cut once,” like the advice given in the saying “three ways of the saw,” they might feel less ensnared in their current circumstances and freer to lop off what’s no longer working. However, no one has the benefit of hindsight, and so it is that these hard-knocked characters with their jagged imperfections do their best—sometimes, despite themselves. Mullins experiments—and succeeds—with style, length, and points-of-view throughout. He’s sprinkled flash fiction, brief sketches, and vignettes between traditional short stories, often in such a way that, from one narrator to the next, there’s a tinge of ‘sameness’ to the voice, thereby linking otherwise unconnected pieces. The language itself is vibrant; the pacing often breathtaking; and the meanderings and meditations of the people throughout both comforting and discomfiting. Good reason for all of that: Mullins, in a fresh and unforgettable voice and writing style, has reached across the human condition, exposing the sinew that holds us together, even while it hopelessly, inevitably shreds. working their way toward the center of that tree’s severed life where he will end by touching the beginning.” Interestingly, the author himself has some experience working for a tree trimming and removal service. Despite what’s gone wrong with the peoples’ lives in this collection, it flares with an uncommon energy and wit. Midwesterners—and, especially, Michiganders—will recognize the physical landscape. 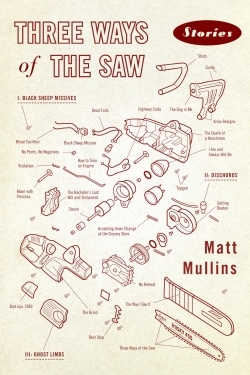 Gutsy and gritty, these raw-boned stories introduce readers to a brave and excellent writer in Matt Mullins.